UAK is a classical chamber choir with a varied repertoire -- but a predilection for recent nordic music. UAK originally stood for "Unge Akademikeres Kor", or Young Academics' Choir, but today the choir consists of both more and less academic singers from 20 to 50 years. UAK practises every monday at Nørrebro in Copenhagen. UAK was founded by Svend G. Asmussen in 1944, and in 2004 could celebrate its 60th anniversary as one of the oldest choirs in Denmark. 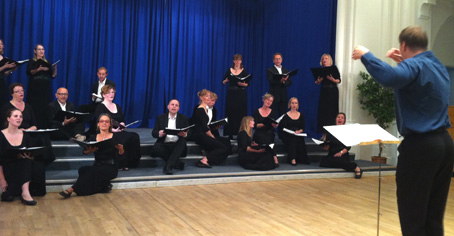 In 1944 the choir made it part of its purpose to make recent danish and nordic choir music better known to the public. The UAK CD "Lige for forår" was born from a nordic composer competition successfully held by UAK in 1999. UAK has held concerts all over Denmark and has toured many countries throughout the years. Our summer tours include Småland, Hungary, Scotland, and Finland.